Colombian government chief negotiator, Humberto de la Calle today announced an historic agreement on agrarian reform had been reached with the marxist guerrilla group the FARC, six months on from the start of peace talks in Havana, Cuba. Previous peace talks shied away from land rights and rural change, an issue which goes to the heart of why the FARC took up arms nearly fifty years ago. But de la Calle confirmed that at last the text of an accord for “an historic change, a rebirth of the Colombian countryside” had been established. Details remain unknown and will have first to face the public vote, alongside the rest of proposals that emerge as part of an eventual agreement on the five point agenda for the negotiations, but many are seeing today´s news as a signal that the peace process has a real possibility of success. While international actors, ex-presidents, prime ministers and top diplomats have lined up to throw their weight behind the talks, in Colombia scepticism about their outcome has grown over recent months. Recent polls suggest, while Colombians are willing to support the talks, the majority are rather less than hopeful they will come to anything. 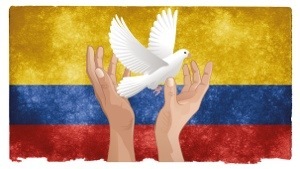 Using the news of this important step forward, Humberto de la Calle and President Santos took the opportunity to ask the nation to renew its faith in the process with the former claiming, “to support this process is to believe in Colombia”. Opinion remains divided though, and a number of high profile politicians considered to be loyal to ex-president Alvaro Uribe reacted with scepticism. Some argue that until we understand what exactly has been agreed it is difficult to judge whether Colombians will accept the proposals. How much has the government given in to the FARC´s wishes? How far have the government been able to move the guerrilla group? Anticipating this response, de la Calle indicated there would be ”an ambitious programme of restitution and adjudication of lands”, but that ”legal landowners have nothing to fear”. Meanwhile Uribe himself is yet to take to the social media to express his view. The normally hyperactive Twitter account of the ex-president remains silent. Politicians of the left have enthusiastically supported the news with Piedad Córdoba, Nicolás Maduro and Gustavo Petro effusive in their praise. Colombia Politics takes a cautious view. Our editorial line has continued to be in favour of the peace talks, and has remained optimistic for their positive conclusion, despite the slings and arrows of the misfortune of the last six months of stalemate. At times the apparently remorseless rhetoric has asked us to question and doubt, but today´s announcement is real cause for hope. However, the negotiations are far from over. Santos has talked of them lasting for “months, not years”, and Internal Affairs Minister, Fernando Carrillo this week issued what the FARC see as an ultimatum that talks would not extend “beyond 2013″. Yet it has taken half a year to agree on the first of five points. Sure, agrarian reform might be the hardest of the lot, but on 11 June the Government and the FARC will sit down to discuss the political involvement of demobilized guerrillas. Remember, all this will have to face a referendum; and if there´s one thing Colombians appear to have little appetite for, it´s seeing señores Catatumbo, Granda, Márquez, Santrich and Timochenko in congress. Work must still be done to move public opinion, and to move the FARC negotiating team towards an agreement the nation can swallow. As de la Calle made clear, “Nothing is agreed until everything is agreed”.